Smriti Jain is the co – founder of ‘I am a Teacher’ (IAAT), a not for profit organization that was conceived in her dreams much before it’s actual launch. Understanding the dire need of reform in teacher education of the country and the inadequacy of the system to prepare effective teachers, Smriti has committed herself to bring about this much needed change in teacher education in India that could fundamentally transform our classrooms and schools. IAAT aims to prepare a critical mass of teachers who are highly capable, passionate and can lead change in and through classrooms. Smriti has been a teacher and a leader since the last 10 years. 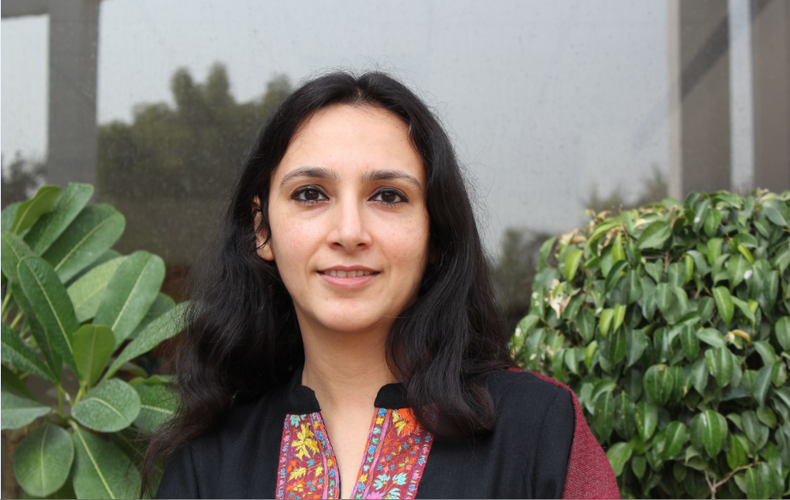 She headed the Middle School at The Heritage School, Gurgaon, leading a team of 50 teachers. She stepped into this role at a critical stage where the middle school was being transformed from a conventional programme to a more experiential, progressive, relevant and child-centered programme. She established an inclusive culture where every voice was heard and every teacher was empowered and gave them the space to reflect, and grow. She found that effective and empowering systems and processes that provided room to engage in reflective thinking, classroom observations, lesson planning and reviewing were some of the key factors that made the transformation possible. She learnt that clarity of purpose and conviction in their beliefs can galvanize ordinary people to do extra-ordinary work. Seeking and learning is what defines me. The search has put me on the path of lifelong learning. This path has led me to nurture a dream of setting up a teacher education institute that pursues excellence and shows the way for teaching and learning in India. I grew up studying in one of the best schools in the city and was sharply focused on achievement in examinations. Inspite of having excelled academically as I graduated, I realized I didn’t really know what to do with my education. I started questioning the years of hard work that I had put into what seemed then like a fairly meaningless pursuit. I started reflecting on my own education that was more about chasing grades and this quest for meaning led me to teaching. This decision gave direction and purpose to my life and also changed me as a person. Ever since there has been no looking back, and I have been in education for more than 10 years now. I have been a teacher and have also worked with teachers. What is the story behind ‘ I am aTeacher’? High absenteeism of teachers, rote learning and fear dominates classrooms in India. There is an overemphasis on teaching to the test, marks and grades versus real understanding. The schools are regimented, structured and classrooms are didactic with a focus on covering the syllabus. Such school systems kill curiosity, excitement and adventure of learning in students. How can we change our schools and truly reform education in the country? Pained by my own education, I started engaging with these thoughts and questions more deeply. I realized, all this is a result of the poor quality of teacher education in India. I knew change had to start at the level of teachers to effect any fundamental transformation in the school education in the country. To further my understanding in this domain, I did my Masters in Education at the Harvard University in Instructional Leadership. I studied the top schools in teacher education in the US and arrived at our own model of teacher preparation, which is more contextualized to our realities. We are launching Post Graduate Diploma in Learning and Teaching (PGDLT), a practice based, one year full time program where students spend a whole year in classrooms teaching alongside mentor-teachers. Besides classroom practice, they have course work through the year that helps them integrate theory and practice. Our thought partner in this initiative is Urban Teacher Residency United, which is an apex organization that has been working on transforming the American model of Teacher education. We also have Boston Teacher Residency, USA and Jodo Gyan as our academic partners in this endeavor. PGDLT will prepare teachers as change agents who will lead reform in and through classrooms. Not many teachers in our country are proud of being teachers. They hesitate to say ‘I am a Teacher’. There is a great need for teachers to find meaning and purpose in their work. We consciously chose this name to help build pride amongst teachers. What is your idea of work-life balance? My work is my passion. I do what I do as it helps me learn and grow as an individual. It is very meaningful for me and is a way of giving back to my community and my world. I do have a family and two children and sometimes to be honest, it does become hard to do justice to all my responsibilities. I feel it is extremely important to be the right role model for my children and I hope when my kids see me as a learner they imbibe that. In many ways life and work merge for me and I see it as one. How do you think the current scenario in teaching is changing? As it is outlined in the National Policy in education, 1986, “The status of the teacher reflects the socio-cultural ethos of a society; it is said that no people can rise above the level of its teachers.” It is important to work with teachers to truly empower our youth and build India of our dreams. Things are changing rapidly but there is still a long way to go. Now we see a lot more young passionate people wanting to get into education. This was not the case 10 years ago. However, for many teaching is still the last option or something that is done for convenience as a half days job. Teachers are still not respected and seen as professionals. But at the same time, we do have teachers who are very passionate about their work and connect deeply with their children. They are very aware of their responsibility and believe they can make a difference in many lives. Teachers will have to be leaders of learning themselves to help their children be lifelong learners. Seeds of change have certainly been sown and we need to nurture it and take it forward. DREAM. DREAM. DREAM. It is very important to dream and connect truly with our aspirations. Very often we get caught in the outer world, and forget who we truly are and what we want to achieve. Believe in yourself and have conviction in your ideas and goals. Pursue something that gives you meaning and joy and makes someone else joyful too. We all have the power to turn our dreams into reality.